Jazz Monochrome / Watercolour by Artist Trevor Waugh for the Exhibition "That's Jazz"
Another watercolour from the show ” That’s Jazz” showing a sax player in monochromatic colour and tones. The loose handling of the medium belies an accurate displacement of shapes and values. 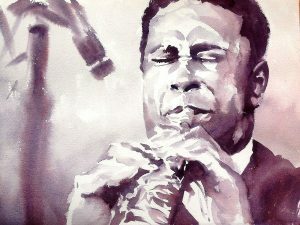 Trevor has captured an intense concentration on the players face whilst he is blowing notes from an alto saxaphone. Wet-into-wet tones describe a microphone and stand in the background which presumably a recording studio. “I wanted to use a mix of 2 colours, Vermilion and Cobalt blue to produce my own unique colour to paint this picture.” This piece is unframed and the shipping costs are included.